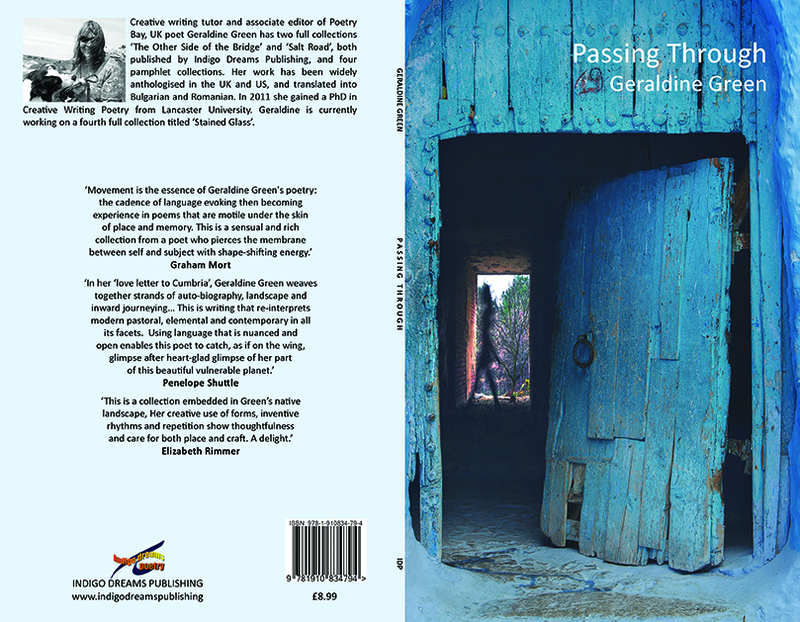 * update* Geraldine's third full collection, Passing Through, will be published in 2018 by Indigo Dreams Pubs. UK poet Geraldine Green former writer-in-residence at Brantwood Coniston Cumbria home of John Ruskin and also former writer-in-residence of Swarthmoor Hall Ulverston, home of George Fox and Margaret Fell, Geraldine has performed widely in the UK, North America, Italy and Greece. She began writing poetry after undertaking a BA Joint Hons. Degree in Imaginative Writing/Literature Life and Thought at Liverpool John Moores University, where she gained a First Class Honours Degree. Fired up by her venture into the academic and creative writing worlds, Geraldine undertook a Research Diploma in Ecopoetics, exploring the influence of the land on the poetry of Emily Bronte. On moving back to Cumbria she continued her academic and creative writing through Lancaster University where she was awarded an MA (Distinction) in Creative Writing Poetry in 2005. This is a new collection of poems that forms an original contribution to knowledge and 80% of my Ph.D. Themes that have arisen during the writing of this material are: time and place, placement and displacement, inner and outer landscapes and an analysis of my creative process, exploring and questioning my use of free verse, the lyrical ‘I’ and inherited voices. Both collection and thesis are an exploration of identity and environment through the medium of poetry. The thesis grew out of a dialogue between the reflective process and the poems and comprises research into the above themes. Drawing on reading of the works of literary critics such as David Lodge and Terry Eagleton, but also of work by new geographers, sociologists, linguistic anthropologists and philosophers (for example, Doreen Massey, Stuart Hall, Paul du Gay and Noel G. Charlton), the thesis and poems tightened into an ever closer dialogue. It also explores my own creative process, how I write my poetry and why, as well as placing it in a wider context of poets, past and present. (e.g. William Wordsworth, Federico Garcia Lorca, Octavio Paz, Philip Levine, Joy Harjo and Louise Erdrich). Underpinning the thesis and collection are questions of identity, culture and place and of how a poetry collection can be a place in which such questions are explored. It was written to illuminate where my poetry comes from, where it is taking me and what can be discovered from the poetry." Her work has been widely anthologised in the UK, US and Italy. She’s had four poetry pamphlet collections published through Flarestack Publications, Palores Publications and Swarthmoor Hall Press. Her two full poetry collections titled: The Other Side of the Bridge and Salt Road, were published by Indigo Dreams Publishing Ltd. in 2012 and 2013. 2015 saw her celebrate ten years of poetry tours in North America at readings that included: The Woody Guthrie Festival Okemah Oklahoma, where she and other poets had the honour of having their work accompanied by internationally known musician David Amram. Geraldine has also performed alongside Beat Poet Michael McClure in Oakland California, at the Walt Whitman Birthplace Long Island, the Bowery Poetry Club New York City and the William Carlos Williams Center, New Jersey. She regularly reads and co-tutors workshops with New York poet George Wallace. UK events include reading with Jacob Polley at the Wordsworth Trust, George Wallace for Apples and Snakes Cornwall and the Dylan Thomas Centre Swansea, Penelope Shuttle Cornwall and alongside Jerome Rothenberg at a Kurt Schwitters’ Celebration Ambleside. and Saxophonist Jess Gillam Finalist of the BBC's Young Musician of the Year 2016. An experienced freelance creative writing tutor Geraldine runs regular creative writing residential courses and workshops at a variety of places in the UK, including Brantwood where she is currently writer-in-residence, for Cumbria Wildlife Trust and for The National Trust. She’s also worked with artists and musicians including ARne Richards and Isabel Knowland of the Oxford Concert Party, digital and visual artists and a photographer. 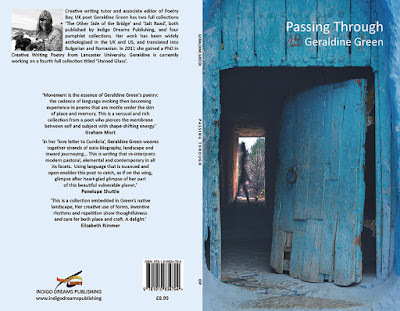 Her new collection, Passing Through, has been accepted for publication by Indigo Dreams in 2018. Geraldine recently co-edited an anthology titled Watershed, a collection of poetry and prose from Cumbrian writers written in response to the 2015 December Floods. Proceeds from the sale of anthology and related readings go to The Cumbrian Community Foundation Flood Recovery Appeal. Former sessional teacher in creative writing at Cumbria University and the University of Lancaster, she is an experienced freelance creative writing tutor, writer, poetry editor and mentor. Geraldine tutors creative writing workshops for Adult Education, Dallam School, Dallam. This poet takes her place in contemporary poetry with work that shines with joy in and respect for language. The vitality of life’s many experiences are evoked here with all the senses. and Sue Sims, Poetry Space "Landscape and Memory"
Thanks to all who came to yesterday's Write in Nature, shared wild winds and poetry, out on Eycott Hill, Cumbria Wildlife Trust's Nature Reserve, north Cumbria nature reserve near Mungrisdale (northern Fells). Car shared from Mungrisdale Village Hall to Eycott Hill, and, just as we set off, a red squirrel hopped across the road in front of us as we drove from Mungrisdale Village Hall to Eycott Hill - a good start to our day! and around us the shaking-you-alive wind that had us sheltering on the north/north-west facing side of the acid green lichened slabs of Eycott Volcanics, when we reached the top, to stop. Lunch. Listen to one of the group reading 'Sedimentary' by Katrina Porteous. Still streaks of snow on the tops, we were in the company of Blaencathra (rocky chair) Carrock fell, with its Iron Age Hill fort, its sides a mass of juniper, the valley the peat brown beck with dubs, ideal for a plunge and swim. To the west, Grizedale Pike, Causey Pike, Catbells; to the south the Kirkstone Fells; east to a limestone ridge fringed by Ash and beyond, to Cross Fell, Hartside, the Penines home of the Helm Wind... north to Carlisle and the Solway ... what a place! Well worth a visit. Looking forward to reading poetry and prose later in the spring/summer and collating it with Jody Ferguson (Cumbria Wildlife Trust) into an online e-anthology for the Trust's website. Finally, big thanks to Jody Ferguson of Cumbria Wildlife Trust. You can find out more about Eycott Hill on their website. Passing Through, new collection with Indigo Dreams Pubs. Thrilled to have my third, full, collection out soon with Indigo Dreams Publishers Ltd. Thank you Ronnie and Dawn!